Is There a Hidden Nutrient in Barbeque? 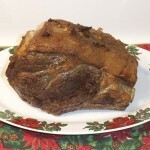 This magnificent prime rib, cooked in front of a hickory fire tasted even better than it looks. We are now right in the middle of barbecue season, and I have cooked a lot of Que, and eaten a lot of Que. And I must say, the more Que I have, the more I look forward to the next barbeque. 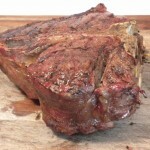 So far, I have enjoyed barbecued grassfed beef, including ribeyes, tri-tips, bone in strip loins, boneless strip loins, center cut shoulder roasts, beef back ribs, short ribs, flat iron steaks, sirloin tip roasts, sirloin steaks, the occasional porterhouse or prime rib or tenderloin, and more, and enjoyed them all. I have also barbecued and enjoyed grassfed bone in lamb legs, boneless lamb legs, lamb shoulder, lamb shoulder chops, lamb ribs, rack of lamb, and some lamb loin chops, and enjoyed all of them as well. And that does not even count the pork ribs, port roasts, pork chops, chicken in many forms and the rare but truly wonderful grassfed bison, which I have also cooked and enjoyed. Does the wood have some kind of unknown nutrient that enters the food through the smoke? No scientific evidence I know of, but sometimes I think it must be true. Why else would it taste so good, be so satisfying, and leave me feeling content and wonderful? Or maybe the smell and taste of meat cooked with wood smoke speaks to something very old and primordial, a vague yet powerful ancestral memory of countless meals cooked with fire and smoke, the oldest way of cooking. Something below the conscious mind, yet very real. All I know for sure is that there is something about cooking barbeque that I truly love, including making and controlling the fire, the smell of the wood and roasting meat, even the sounds of the fire. 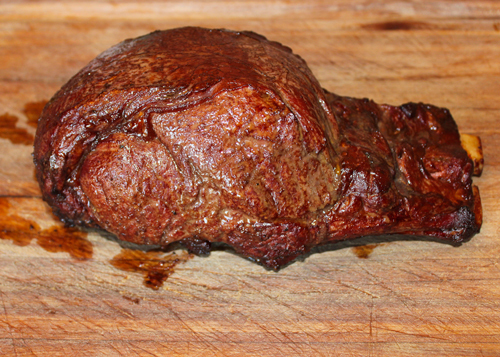 And there is something about barbequed real meat that tastes better to me and satisfies me more than any other food. Well, enough writing about it. Time to do it again, this time a big thick strip loin cooked in front of an oak fire. I am getting hungry just thinking about it. When I think barbecue, I think about the magic of wood and charcoal, of fragrant smoke, of the heavenly smell of meat roasting in front of a charcoal fire. Yet most people have gas barbecues. I was faced with a choice when I wrote Tender Grassfed Barbecue. Should I write it for charcoal barbecues, or gas barbecues, or both? Writing it for both would give me the widest audience, and the most sales. Yet I chose to write it for charcoal only, though I did include a small section on how you could use a gas barbecue. Why? Because our ancestors used wood coals, and 100 percent hardwood charcoal. I always try to honor tradition in my books, and there is no tradition in gas grilling. The traditional fuel is wood burned down to coals, or 100% hardwood charcoal. And it tastes so much better. Our ancestors cooked a great deal of their meat in front of fires. The fires were usually made of wood burned down to coals, or 100 percent wood charcoal, which has been used for thousands of years. The wood and the charcoal give a distinct and glorious flavor to barbecued meat, and have other cooking benefits that you do not get from gas. I also like starting a fire, controlling it, adjusting the heat by how I adjust the vents, and adding flavor to the charcoal with wood and herbs. I enjoy looking at the coals, judging when they are just right to begin cooking. I love the smell of meat roasting in front of charcoal, which mingles with the glorious smells of the fire to make my mouth water in anticipation of the joys to come. And I love the flavor that comes only with the use of wood or charcoal, or both. No gas grill can provide these experiences, though it is possible to get some wood taste into meat by using smoking chips with a gas grill. And I believe that cooking with wood and charcoal adds something special to the meat, something that may even improve its digestive and nutrient qualities, since humans have been cooking this way since the beginning. I have no scientific proof of this, but I feel in my heart that it is true. 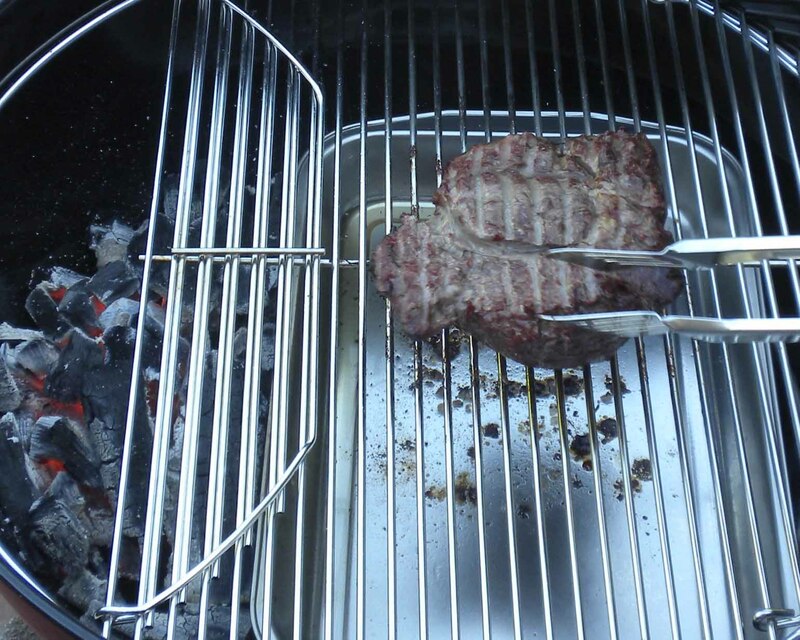 Many people who use gas barbecues talk about how they are much more convenient. But cooking with charcoal can also be very easy and convenient, as advances in barbecue technology has made it so much easier. I have developed a system, using a chimney barbecue starter, a drip pan, a meat thermometer, and a covered kettle grill, that is very easy to use and makes the most delicious barbecue I have ever tasted. This system is at the heart of Tender Grassfed Barbecue. Starting the fire, controlling the temperature, avoiding flare-ups, and cooking the meat is very easy with this system, and I use it most days when the weather and the law allows. And a little extra effort is so rewarding, in taste, in the pleasure of mastering fire, in the wonderful smells, and, best of all, in the delicious food it produces, which I love to eat. First of all, I have a confession to make. I have never used a gas barbecue. I have had friends with gas barbecues test my ideas on how to add some barbecue flavor, and have tasted the successful results. But I have never used one. Not even once. That said, I respect the right of everybody to use the method of barbecue they prefer. And I have tasted a fair amount of barbecue cooked with gas. Some of it was good, but all of it was lacking, in my opinion. And what it lacked was the magic of wood and charcoal. In my opinion, there is something magical about cooking with wood and charcoal, the qualities and tastes and textures it creates, which are like no others. And the smell, the wonderful, heavenly smell that makes my mouth water and gets me hungry in a way that no other form of cooking has ever done. Finally, grassfed meat, my favorite food in all the world, and charcoal cooking were made for each other, being perhaps the oldest food of mankind, cooked in the most traditional way. This union of fuel and meat, when done right, appeals to a taste that seems to be coded into our very genes. People have been eating meat cooked with fire for a very long time, since the beginning. 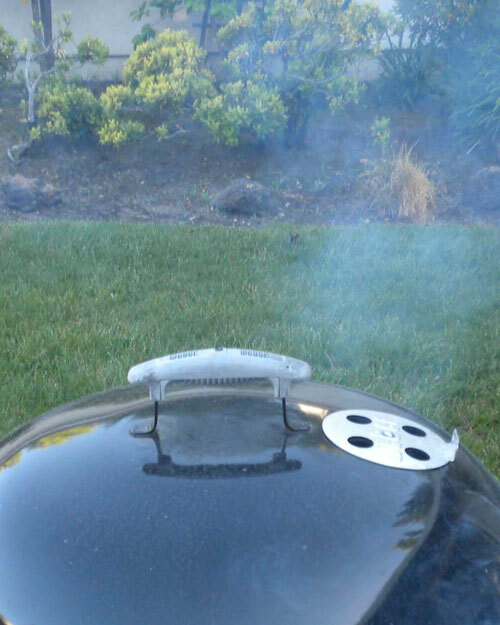 People have only been using gas for barbecue since the twentieth century. For these reasons, barbecue means wood and charcoal, to me. Barbecue season began for me yesterday. 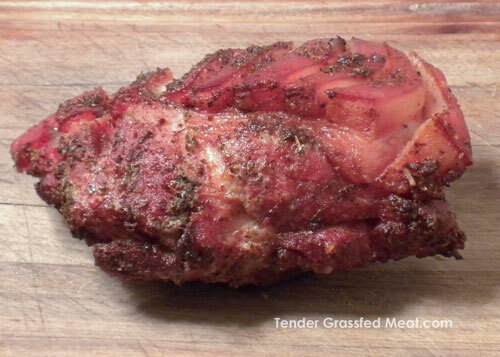 I opened Tender Grassfed Barbecue to the recipe for Roast Pork with Mediterranean Myrtle, in the Style of Sardinia. I marinated a pastured pork loin with traditional ingredients. I took the barbecue out of the garage, set it up, arranged the coals, lit the fire. I watched the first coals catch, and spread the fire to the others. I watched the flames as the hardwood charcoal burned down, filling the air with the fragrance of wood smoke. When the coals were ready, I placed the pork loin in front of the fire, added some Mediterranean myrtle leaves to the coals, put the cover on, and inhaled the fragrant smell, feeling great satisfaction. I adjusted the vents to control the temperature, added coals when called for, and enjoyed my mastery of the fire. The smell of the burning coals, fragrant leaves, and roasting meat made me so hungry. I was enjoying one of humankind’s oldest experiences, cooking real meat in front of a real fire. It got even better when the meat was finally ready, and I cut thin slices of fragrant pork, and tasted the flavors of the meat, the herbs, and the wood. So good. So satisfying. So old, yet so new. And utterly delicious. Barbecuing meat has been associated with health risks, based on various studies. Yet our ancestors, and the peoples studied by Dr. Weston A. Price, cooked most of their meat in front of a fire, without developing the diseases indicated by the studies. A review of the studies on the subject led me to realize something important. The risk factors were always associated with cooking the meat over direct high heat. While most Americans associate barbecue with cooking directly over a hot fire, whether charcoal or gas, our ancestors rarely did this. By cooking their meat in front of, but never directly over, the fire, they avoided scorching their meat, and avoided the risk factors identified by various studies. Concern has also been expressed about some chemicals that are released from burning wood, such as creosote. Our ancestors had this one covered as well, as they invariably burned their wood down to coals before placing the meat in front of it. By the time the wood burned down to coals, the chemicals had burned off. Our ancestors often cooked with natural charcoal, which was and is made by partly burning wood. This process also burns off the toxic chemicals. It is just about certain that most of our ancestors cooked their meat in front of the fire, and that this is the oldest human way of cooking meat. Our bodies have no doubt adapted to the combination of meat cooked with wood coals. I cook grassfed meat in many delicious ways, and enjoy all of them, but real barbecue has always been my favorite. Grassfed meat is humankind’s oldest food, and wood coal fires are humankind’s oldest way to cook it. The meat and the method go together in delicious perfection. Cooking with fire gives grassfed meat a flavor, texture, and tenderness that cannot be matched in any other way. I usually cook with charcoal, as it is much easier than burning wood logs down coals, and is the oldest cooking fuel after wood itself. I only use lump charcoal, or briquettes made from 100 percent hardwood charcoal with a starch binder. This helps recreate the traditional flavors, and makes for a fire that is very easy to control. I barbecue grassfed beef, grassfed lamb, grassfed bison, pastured pork, and sometimes chicken or even wild fish. No matter what I make, I love it. Barbecuing can be very difficult, or very easy. I prefer easy, and have perfected a simple method to cook meat in front of the fire, not over, control the temperature, and produce absolutely delicious barbecue meats. This method is detailed in Tender Grassfed Barbecue, along with more than a hundred delicious traditional recipes for many kinds of barbecued meats. I am getting hungry now. Barbecuing tender grassfed meat the traditional way with indirect heat. July the Fourth is near, and that means barbecue. It is an old American tradition, and a most delicious one. Barbecues in America go all the way back to colonial times, where easy access to inexpensive meat and wood meant delicious grassfed feasts cooked with logs burned down to coals. Barbecues were huge social events, often drawing hundreds or even thousands of people, lured by the ancient pleasure of pastured and wild meat cooked with fire. But today, many are afraid to barbecue, being concerned by studies that find that suspected carcinogenic substances are created by the barbecue process. Not to worry. Even if these studies are accurate, you can avoid the cooking method that creates the suspect substances by using traditional techniques, which are perfect for cooking grassfed and pastured meats. I was concerned by these studies, and I must admit I stopped barbecuing for awhile. But I really missed the wonderful flavor that can only come from real barbecue, so I decided to take a close look at the studies. I wanted to resolve this paradox. The healthy peoples studied by Dr. Weston A. Price nearly all barbecued most of their meat and fish, and they had no cancer, despite the modern studies stating that barbecuing created carcinogens. Just as puzzling was the fact that humans have been cooking with fire for uncounted thousands of years, yet cancer is a very modern disease, unknown among people eating a traditional diet. If cooking with fire created cancer, humanity might have died out a long time ago. There had to be another explanation. I decided to start by looking at the raw data. The studies found that barbecuing created two substances that were believed to be carcinogenic. One substance was created by cooking meat over direct high heat, especially when the flames touched the meat. The second substance was created when fat from the meat dripped directly on to the heat source, which created a smoke that went into the meat. The key is that these substances were created only when the meat was cooked directly over the heat source. My next step was to study the barbecuing methods of traditional peoples, which I did. What I found was fascinating. Most traditional barbecue was never done directly over the heat source. This was true for most peoples all over the world, and over time. The meat was cooked in front of, never directly over the heat source. The meat was invariably cooked over a container to catch the drippings, which were used for basting and as a condiment. This meant that the meat was never cooked over direct high heat, and never touched by the flames. This also meant that fat never dripped into the fire. There were some exceptions to this rule. Some traditional peoples grilled directly over the fire, but set the grill so high over the coals that the heat was gentle, and the flames never touched the meat. Some European cooks grilled directly over the fire. The people who wrote older cookbooks looked down on this practice, stating that it gave “a noisome stink” to the meat, or that it was the mark of a bad cook. Some peoples cooked small pieces of heavily marinated meat over a small fire, but this was the exception. Even these people kept the heat of the fire low, and kept the flames from touching the meat. Interestingly enough, the studies found that marinating meat reduced the formation of the suspect substances by 90 percent or more. In other words, the cooking method that creates the carcinogens was not used by most traditional peoples. Use their methods, and you will not create the potential carcinogens mentioned in the studies. But What about the Smoke? A number of articles have been published over the Internet that point out the toxins given off by burning wood. But this is not a problem in traditional barbecue. That is because the most common fuel was one hundred percent hardwood charcoal. Charcoal is made by burning wood under controlled conditions. The toxic chemicals burn off during the process, and are gone by the time the charcoal is made. This process goes back many thousands of years. Barbecue experts and traditional peoples did not cook over blazing raw wood, but made sure to burn the wood down to coals before cooking. Burning the wood down to coals also burns off the toxic chemicals, which literally go up in smoke. So you can avoid the toxins in raw wood smoke by using one hundred percent hardwood charcoal, or burning your wood down to coals. These are the most traditional ways of using wood for cooking. Cooking in front of, not over the fire, is very different from the way most Americans grill. Grilling over direct high heat results in the creation of the substances mentioned in the studies. I believe that this method was created to deal with the extra water in factory meat, which requires direct high heat to be somewhat palatable rather than grey and soggy. But grassfed meat, including steaks and burgers, cooks beautifully in front of, not over the heat source. The meat is never scorched or charred, and picks up a wonderful flavor from the coals. You can avoid the risks and have a perfect cooking method for grassfed barbecue by cooking in front of, not over the heat source. This cooking method is used in all the recipes in Tender Grassfed Barbecue, and is the method I use whenever I barbecue. This July 4th, we are going to enjoy a beautiful thick prime rib steak, cut from a beautiful grassfed roast we got from U.S. Wellness Meats. And we will enjoy without fear, following the tradition of our ancestors. This post is part of Monday Mania, Fat Tuesday, Traditional Tuesday, Real Food Wednesday, Freaky Friday, and Fight Back Friday blog carnivals. Bison Porterhouse Steak, page 126, Tender Grassfed Barbecue. I have a huge problem with this advice. These experts NEVER distinguish between factory red meat and grassfed red meat. Factory red meat is raised with the use of chemicals, fed unnatural feed sprayed with pesticides, and often bizarre feeds like chicken manure, donuts, and candy bars still in their wrappers. Grassfed meat is raised on green living grass, without the chemicals, and unnatural feed. The difference between these two types of meat is huge, as they are very different in their content and composition. The studies used by these experts for the basis of their opinion NEVER distinguish between factory meat and grassfed meat, treating them like the same substance. Since over ninety-eight percent of the red meat eaten in the U.S. is factory meat, those studies really only apply to factory meat, not grassfed. 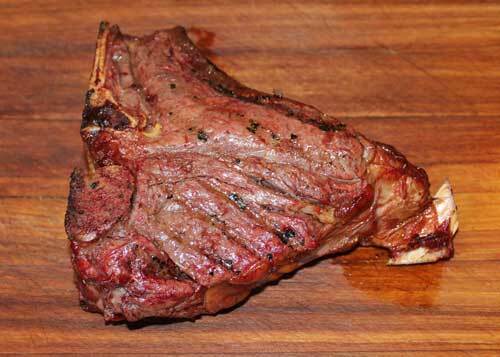 Our ancestors barbecued red meat all the time. In fact, a huge portion of the meat enjoyed by humanity for thousands and thousands of years was cooked with fire. But until modern times, nearly all of this meat was grassfed. Is Grassfed Meat Dangerous to Barbecue? Every food has some element of risk, but I do not worry about barbecuing grassfed meat. As long as I use the traditional techniques described in my book, Tender Grassfed Barbecue, and as long as all the red meat I barbecue is grassfed or pastured—I feel fine. The studies that demonize red meat and claim it increases cancer risk all have a huge flaw. Since all these studies are based on factory meat, they are not just testing meat. They are also testing the effect of the chemicals, growth hormones, and unnatural feed in the meat. Is the increased cancer risk found by these studies created by the meat, or by the chemical additives to the meat, or by the unnatural feed, or by the combination of some or all of these factors? No study has resolved this issue, and no study has addressed it. To the studies, red meat is all the same. A few recent studies have tried to differentiate between fresh red meat and processed meat. But even these studies do not distinguish between factory meat and grassfed meat. The studies that have found that barbecuing red meat increases cancer risk also treat all meat the same. In addition, it appears that the meat was cooked by direct high heat, directly over the heat source, in all these studies. Most Americans use direct high heat when they barbecue. So, in looking at these studies, we must ask—What causes the increased risk of cancer? Is it the meat? Or the chemical additives to the meat? Or the unnatural feed? Or the barbecuing methods? Or any combination of these? There are no modern studies that address these questions directly. But there is an older study, one that I consider to be the most well researched, well reasoned, and valid nutritional study ever made—the research of Dr. Weston A. Price. Dr. Price, a dentist and researcher, noticed that in each generation, his patients were sicker than their parents, and had worse teeth. Dr. Price suspected that the reason was nutritional, and spent many years traveling the world to study those peoples who were healthy and had great teeth. Dr. Price found that the peoples he studied, eating the diet of their ancestors, were free of the chronic diseases that plague modern cultures, and had perfect teeth. One of the diseases they did not have was cancer. And nearly all of these peoples barbecued grassfed meat. Some of them ate huge amounts of grassfed meat, often barbecued. So, based on Dr. Price’s research, eating barbecued grassfed and wild meat does not cause cancer. In researching traditional barbecue methods, I learned that almost nobody barbecued meat directly over a very hot heat source, which is the most common barbecue method in the U.S., today. Our ancestors either cooked their food in front of, but never over a fire, or they placed their meat so high above a low fire that the meat would never get scorched or be touched by flames. This is completely consistent with modern studies that have found that substances believed to be carcinogenic are created by grilling meat directly over a hot heat source or by fat dripping directly over the heat source. These risks can be avoided simply by barbecuing as our ancestors did, and never putting meat directly above a hot heat source. Interestingly enough, some of the experts also advise avoiding high heat when barbecuing. I trust the research of Dr. Price, which showed that people can eat large amounts of red, grassfed meat while remaining free of all cancer. Should Meat Be Pre-Cooked Before Grilling? Some of the experts advise that you partially cook all meats before barbecuing them. The theory is that the less time the meat is the barbecue, the safer it is. That conclusion is simply not supported by the studies which found that the substances believed to be carcinogenic were created by cooking over direct high heat. If you barbecue in a traditional manner, this problem is solved. Our ancestors did not pre-cook meat and finish it on the barbecue. And they most certainly did not “nuke” the meat in a microwave, which some of the experts advise. In fact, I never use a microwave, not for any purpose. Microwaves heat food from the inside out, something that was never done in all the history of human cooking before. Some research has found that microwaving foods changes their very composition, in ways that have never occurred before. Not something that our ancestors ate and not something that I want to eat. And, to be honest, the very thought of “cooking” food with microwave radiation gives me the creeps. I would much rather stick with the kind of heat used by our ancestors. Parboiling foods to be barbecued ruins the taste and texture, in my opinion. Properly barbecued grassfed meat is tender, with the savory wood smoke flavor that only real barbecue can give. The wood flavoring of barbecued meat takes time, and reducing this time by pre-cooking means less flavor. Should Only Lean Meats Be Grilled? The “safer barbecue” advice this year not only contains the traditional prohibition of all red meat, without differentiating between factory meat and grassfed meat, but also recommends what should be grilled. The selection does not excite me. They recommend skinless, boneless chicken breasts, and vegetables, and fish. All of these foods are low fat. It is true that some studies have found that fat dripping directly on the heat source is a factor in creating substances believed to be carcinogenic. But you do not need to eat low-fat meat to avoid this problem. All you have to do is not cook your food directly over the heat source. The fat of grassfed animals is not only very different from the fat of factory animals—it adds enormous flavor, as well as vital nutrients. In fact, animal fat ranging from butter to suet to lard is a huge part of my barbecue cooking. Our ancestors used and cherished this natural fat, and used it extensively in every kind of cooking, including barbecue. To me, barbecue means what it almost always has to our ancestors—meat. And I do not include boneless, skinless chicken breasts in my cooking, as they have been stripped of the very parts that give them the most flavor, namely, the skin and the bones. You can grill vegetables, if you like, but I have never done it. I would much rather barbecue grassfed meat. Should Barbecued Meat Be Marinated? Traditional peoples marinated the meat they barbecued, and/or basted it. The experts do advise marinating, and I agree with them—to a point. They emphasize marinades made almost entirely out of acidic ingredients such as wine, vinegar, or lemon juice, where my marinades, based on traditional combinations, always include a good amount of healthy fat. Too much acidic ingredients in a marinade will toughen grassfed meat. Our ancestors always used plenty of fat in their marinades and bastes—and so do I. This kind of marinade and/or baste not only may be beneficial, but makes the meat more tender and delicious. I stopped barbecuing for awhile, being concerned with the studies connecting barbecue with the creation of carcinogens. I really missed it, so I started researching traditional barbecue. I was delighted to discover that the risk factors caused by the grilling process could be avoided by using traditional barbecue methods. I was also happy to discover that these methods worked perfectly with grassfed meats, being ideal for them. My research led to the discovery of many traditional and delicious marinades and flavor combinations. This research was the foundation of my cookbook, Tender Grassfed Barbecue, which is full of delicious recipes, based on tradition, and cooked with an easy method that avoids direct high heat. 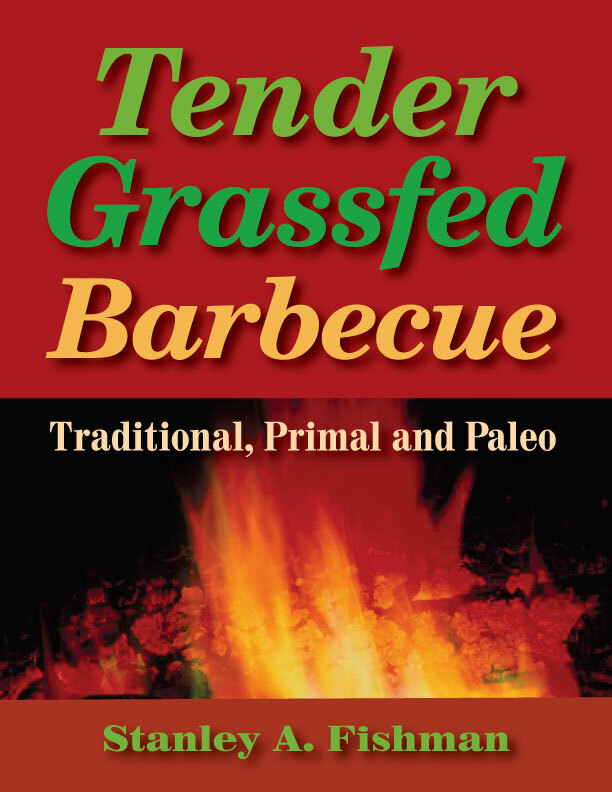 I am happy to announce the availability of my second book, Tender Grassfed Barbecue: Traditional, Primal and Paleo. It is now available at Amazon. This cookbook adapts traditional methods of barbecue to modern times, making it easy, yet so delicious. The recipes are specifically designed for grassfed beef, bison, lamb, and pastured pork, using a wide variety of traditional flavorings and marinades from all over the world. Grassfed meat is different from factory meat, and should be cooked differently. This is even more true in barbecue than other cooking methods, because charring a grassfed steak over a very hot fire will ruin it. The methods in this book are adaptations of traditional methods of barbecue that work beautifully with grassfed meat, bringing out its naturally wonderful flavor and tenderness. Traditional peoples cooked with fire very differently than modern Americans. Tender Grassfed Barbecue adapts some of their methods to modern times. These methods are actually safer and easier to use than modern techniques. The book explains how to use these simple methods in great detail, using clear illustrations to demonstrate exactly how the coals, meat, drip pan and grill should be arranged, and providing clear and precise instructions as to how to barbecue this way. Even if you have not barbecued before, the clearly presented methods used in this book will make it easy! The recipes in this book use traditional flavors from many cultures, ranging from Ancient Rome and China to the Native Americans, Koreans, French, Italians, Sardinians, Romanians, and many more. This includes several “lost” barbecue secrets that have been rediscovered, and were used traditionally by many peoples. These wonderful flavors give a wonderful enhancement to the great natural taste of barbecued grassfed meat, resulting in tender meat that is absolutely delicious. The book also offers different traditional ways of preparing American barbecue favorites such as brisket and spareribs. The flavor of meat cooked with fire is one of the oldest human flavors, enjoyed over countless thousands of years, stimulating our taste buds in a way no other food ever does. The traditional cooking techniques in Tender Grassfed Barbecue create this primal flavor, using lump and hardwood charcoal to awaken the primal taste memories, imbuing the meat with the unforgettable tang of wood flavor. Many of the recipes are simply seasoned to bring out the primal flavor of wood and charcoal. Methods for using herbs and wood to provide a deeper smoky flavor are also included. The meat of grass-eating animals cooked with fire is one of the oldest human foods, eaten widely in the Paleolithic period and earlier. In contrast, the grain-feeding of grass-eating animals was not adopted until the 20th century and created a meat that is very different in composition and content from the meat enjoyed by humanity over most of history. Most of the meat recipes in Tender Grassfed Barbecue are very useful for those on Paleo diets, as they are designed for barbecuing grassfed meat. The ingredients used for flavoring are very basic foods, and allowed on most Paleo-style diets. While this is not a low-carb cookbook, most of the recipes are very low in carbohydrates. A section on low-carb side dishes is also included. The recipes in this cookbook are faithful to the teachings of Dr. Weston A. Price. Sugar and soy are not used in the recipes. Refined food ingredients are rare, and the benefits of using animal fats in cooking are not only discussed, but shown in a number of recipes. Butter is a key ingredient in a number of recipes, and modern vegetable oils are not used. There have been a number of studies that raise health concerns about barbecued meats. The traditional techniques used in Tender Grassfed Barbecue avoid the risk factors identified in the studies. If you liked Tender Grassfed Meat, you will enjoy this book if you barbecue. All the recipes are brand new, as are the techniques and cooking methods. The marinades in this book could be used to cook indoors as well, using the timing for roasts and steaks contained in Tender Grassfed Meat. One major difference is the inclusion of recipes for pastured pork, which was not included in Tender Grassfed Meat. I am very happy to present this book. You will find cooking and barbecuing tips here that are just not available elsewhere. The recipes are easy to prepare, nourishing, and delicious. My family and I have been enjoying the recipes in this book for most of the past two years, whenever the weather allowed barbecuing. I hope that you too will enjoy the wonderful flavors and tastes in Tender Grassfed Barbecue. This post is part of Fat Tuesday and Real Food Wednesday blog carnival. Pastured pork spareribs barbecued the traditional way. Convenience has a high price. I just threw out an old cookbook that was all about making cooking easier by using prepackaged mixes, canned soups, broth cubes, microwaves, and other modern ways to make cooking easier. The main cooking skill you needed to use this book was the ability to open packages. Nothing was mentioned about the miserable nutritional profile of such “foods,” or about the effects of all the chemicals and preservatives. Or the fact that real cooking tastes so much better. Convenience is a big part of modern American barbecue. Gas grills, pellet grills, premade factory sauces, premade factory rubs, premade factory marinades, all make barbecuing so convenient. The problem is that this convenience destroys the very factors that make true barbecue so delicious and nourishing. I used to barbecue on an electric-powered grill that used wood pellets as fuel. You could actually set the temperature for how hot you wanted it, in degrees just like an oven. All you had to do was make sure the hopper was full of pellets, and then turn it on. It was easy to use. I thought the food cooked on it had a nice flavor, much better than any gas grill. Well, a funny thing happened in the two years I spent writing my upcoming barbecue book. I decided to try to recreate traditional barbecue methods. This meant making a real fire, with real lump charcoal, or hardwood briquets that were made completely from hardwood, or burning hardwood down to coals. This meant making all my own marinades and bastes, from scratch. I got a common kettle grill that was powered by nothing but my own body and the fires I built in it. I used this grill to cook every meat recipe in the book, at least twice. And the barbecue I produced on this traditional style grill was so much better than the pellet grill, there was no comparison. It was less convenient, and took a bit more effort. But it was worth it. I decided that I was going to make the most traditional American sparerib barbecue I could, for a friend who came over two days ago. I made an heirloom baste that was developed in the 1930s, by simmering various fresh vegetables and spices for hours, straining the liquid, and refrigerating it overnight, then adding a few traditional seasoning liquids, and simmering it again. I used this baste as a marinade for some pastured spareribs, which sat in the baste for two days. I built a fire out of hickory wood and hickory charcoal, and burned it down to coals, using tongs to move various pieces so they would fit properly in the fire bed. I drained the ribs, boiled and strained the baste that had marinated them. I made a rub out of various traditional spices, and sprinkled it all over the ribs. I cooked the ribs slowly, first with moderate heat, then with low heat, basting them every 20 minutes, for two and a half hours. We were rewarded with spareribs that were so good it is hard to describe them. 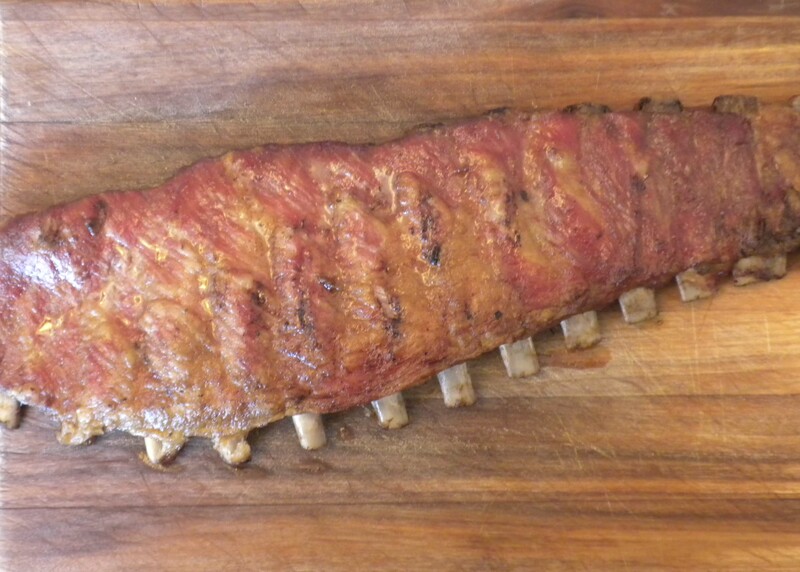 So tender, with a nice pink smoke ring, and the kind of deep, smoky barbecue taste that can only be created by real barbecue, with a real fire, made with real fuel. That taste was so outstanding and memorable that I am still savoring it, two days later. It was the real thing. No gas grill, no pellet grill, no processed condiments will ever come close to producing the real thing. This recipe for spareribs is advanced, but I was trying to make the best ribs I possibly could, in the old style. I intentionally kept most of the recipes in my upcoming barbecue cookbook simple and easy to make. All of these recipes rely on the magic of real fire, real fuel, real seasonings, and real grassfed and pastured meat to make totally delicious and nourishing food. This post is part of Fight Back Friday and Monday Mania blog carnivals.